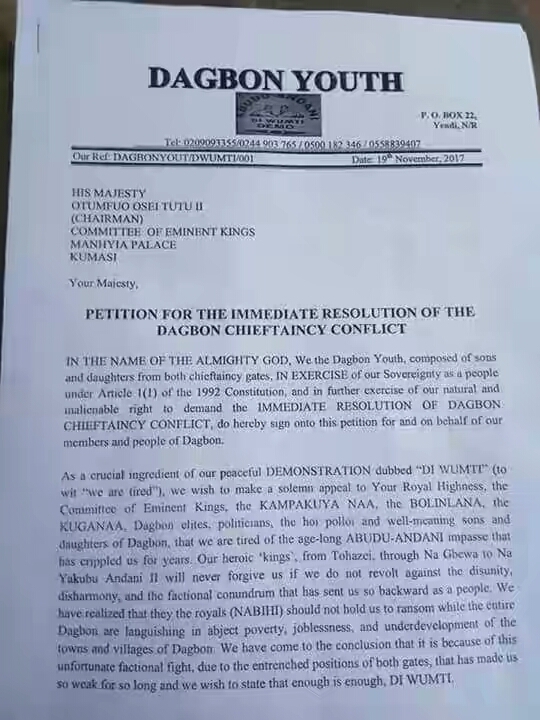 Hundreds of Dagbon youth have embarked on a demonstration to register their displeasure at what seems to be the never-ending chieftaincy crisis in the region. 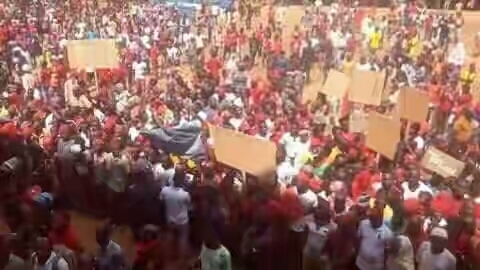 Some concerned youth of Dagbon, today, hit the streets of Yendi to demonstrate to the leaders for peace and also the youth demand for an immediate cease fire from the two feuding factions – the Abudu and Andani gates – who for years have been at each other’s nerves over which of them has the right to rule. The peaceful demonstration dubbed ” Diwumti (literally we are tired), was staged by the youths of Yendi and its environs to sternly speak to the Committee of Eminent Kings and the government to help salvage the Dagbon Kingdom for the future generation. 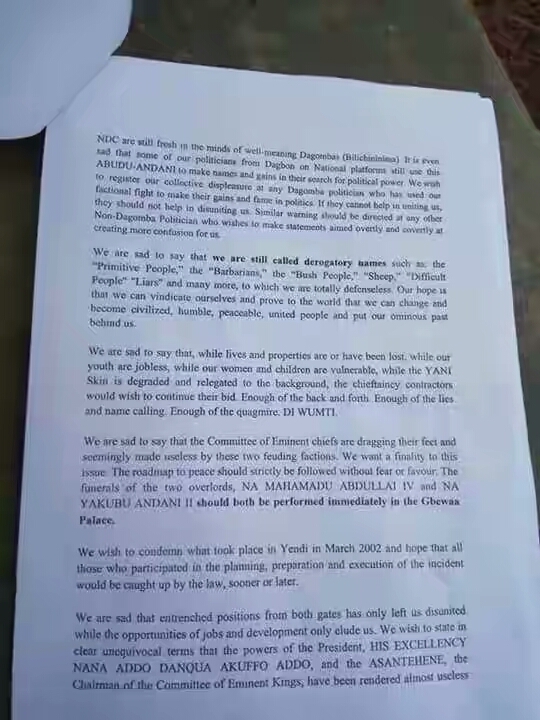 The future of Dagbon is at stake and we would like all and sundry, particularly all individuals involved in the resolution processes of the Dagbon chieftaincy crisis. Public Relations Officer of the Dagbon Youth, Malima Zuno Abdulai told "Nasara Multimedia" that the youth have had it, and will no longer tolerate any acts of violence. He said development in the area has suffered as a result of the 15-year conflict and it is time to end it. “The Dagbon dispute has destroyed so many things in Ghana and that of the Dagbon traditional area. It retards development, brings about destruction of lives and property and affects Dagbons wherever they are. Many companies are closing shop, reducing operations or issuing profit warnings. Economic growth projections have been slashed from 5.5 per cent early in the year's to 5.1 per cent last month due to the conflict“. He continued, we therefore wish to appeal to all stakeholders particularly our fathers in both parties to respect and obey the final agreement that would be arrived at saying, “we the youth are no more going to accept further excuses from both parties and would as such support any individual or persons who stand by this outcome and wish to further appeal to government to be firm on the implementation of the final outcome“. 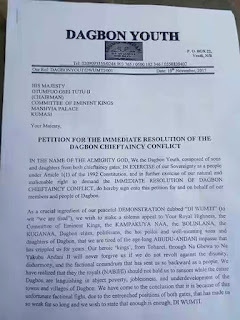 “The Dagbon Kingdom has suffered for far too long under this crisis, and we believe enough is enough. Dagbon must be restored today for a better tomorrow. We would further resist any attempt by individuals who may try to foment trouble in the name of the youth“, he said. The youth also presented copies of petitions to demand an end to the issues surrounding the chieftaincy dispute.